Old school selling claims that a good salesperson can sell anything to anyone. That may have been true to a slick snake oil salesman conning an innocent country bumpkin in the last Century. But times have changed. Your customers are intelligent, educated, jaded, and suspicious; you can barely sell them a product they know, like, and trust. Modern sales is about intelligent conversations that facilitate a transaction that a customer has already decided to make. 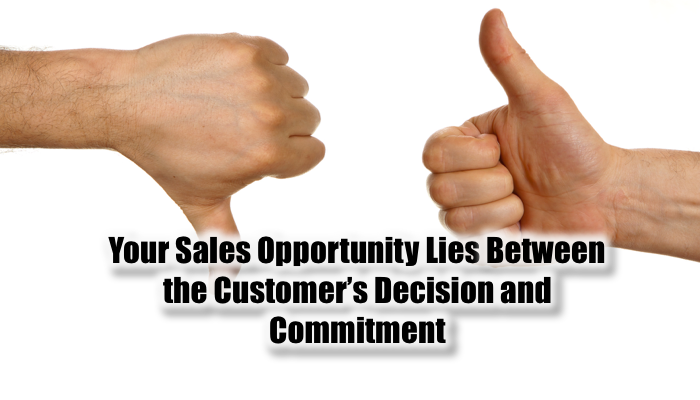 The sales activity occurs between when a customer decides to buy something and when they make the commitment. Have you decided to go on vacation this year? If not, stop reading and make plans; you need to get a life. Have you committed to go on vacation this year? What’s the difference? Tickets! The difference between decision and commitment is the transaction. The time between when they’ve made a decision but haven’t made the commitment is when your sales activities have the biggest impact. When a customer calls you, they’ve made a decision to make a purchase, and they’re acting on that decision – performing research, getting pricing, choosing a vendor, making the transaction. Their priorities determine how fast this goes. If it’s a blood-spurting problem, they’ll buy as soon as you can prove that you will solve their problem. If it’s less urgent, it will take more time until the customer chooses a deadline (which could be your limited-time sales offer.) Remember: no deadline, no deal. When calling prospects, you’re looking for people who have decided but not yet made a commitment. All other conversations aren’t sales, but prospecting or marketing, informing prospective customers about something they didn’t yet know about, or customer service, maintaining the relationship so that you’re on their short list when they decide. Their answer tells you what information they need, what offers they’d find attractive, and the priority of their purchase. You might be thinking, “But, Mark that’s not how sales works. I have lots of interested prospects that I can sell.” Oh yah? Why haven’t you closed them? I’ll tell you why. People invent lies about you to justify their rude behavior towards your sales activities. That’s why bad cold calling ends up degrading a brand – they hang up on you and make up a reason that puts you in a negative light. Prospects are more averse to doing business with you then if you never called them. Bad cold calling is a form of sales prevention. If you were around in the 80s, you probably remember those discount long distance service cold calls during dinnertime? Didn’t do much for the MCI brand, did it. Customers will tell you what they think you want to hear to get you to do what they want. You may want to read that line again. There’s powerful understanding in those words. Customers often position their decision as “I’m thinking about…” because they know that if they tell a salesperson, “I’ve decided to buy…” they will be a target for high pressure sales. For this reason, they act less interested than they are. Conversely, customers will act interested if they want something that you’re offering as a giveaway. The solution to this? Take the spotlight off the product and on the outcome that your customer seeks. Instead of pitching your product, understand what your customer wants to experience. This switch in attention subtly, yet profoundly changes the dynamic between sales professional and customer, to the benefit of both. You might like to listen to other topics like this on the SellingDisruptionShow.com, the weekly podcast for professionals whose job depends on disruptive sales and marketing.